If you’re looking for the cheesiest, creamiest, EASIEST and best homemade potato soup recipe, look no further! This is the potato soup recipe you’ve been looking for! This recipe has been a family favorite for YEARS and I am so excited to share it with you finally! It’s super easy to prepare, too. Made with minimal ingredients and cooks in no time at all! You are going to love this potato soup recipe like we do! We’ve had this on our family menu forever! Not only that, but when we’ve made it for friends and guests, we’re always asked about the recipe! It is seriously that good, friends! You’re going to want to bookmark this one and save it for later! This homemade potato soup recipe has been a family favorite of ours for years and years. It’s actually a shock that I haven’t shared it you guys sooner, haha! I’m so sorry! I didn’t mean to keep it from you guys in any way, I promise! It really is that kind of a recipe that beckons you come wintertime when all you want is something warm and yummy on a cold winter night. Curling up to a bowl of this at night is like a winter dream. My son is vegetarian, too, and so we leave the bacon bits out of it and serve it only to those meat eaters of the household because he too adores this recipe like the rest of us. So if you have any vegetarians in the family that still consume milk and cheese like my son does, they can enjoy this right along with you! We make this potato soup recipe opting for more cream and cheese than other recipes call typically for, and with good reason. I mean, can you blame me? Sure, we can opt to add in a cup of chicken broth to dial down that thick creaminess and go for a lighter version, but this one is chock full of cream and cheese – such deliciousness! And sooo worth it! This soup is so ridiculously creamy and thick, you might even consider it as a creamy loaded potato soup. instead Or, you might even call it a creamy mashed potato dish in a bowl! Loaded mashed potato soup recipe, perhaps? Whatever you call it, just be sure to make it and enjoy it with people you love! Yes, that cheese pull is real! That ooey-gooey melt in your mouth cheese with cheese on top, gah! If I hadn’t already had this for lunch I’d be in the kitchen heating these leftovers up right now! This potato soup recipe makes a huge batch which is fantastic for big families, events, leftovers, and more! You can halve it if you need to for smaller families or occasions. I personally prefer having a big ‘ol batch of this at the ready in the wintertime – for lunches, for soup and sandwiches! Sometimes we just have a soup night where we make this and our other family favorite, Chicken Tortilla soup! Pair this fantastic soup with some grilled cheese or do soup and salad, it is just so wonderful and so simple! This is one of the most requested recipes in the house and never disappoints ever! Whether you’re enjoying watching a football game or on a Netflix binge, this cheesy potato soup recipe is a huge crowd pleaser and one your family will enjoy for many winters to come! Using a sharp knife, prick the potatoes a couple times on each side and bake in the microwave (refer to your microwave directions for duration). 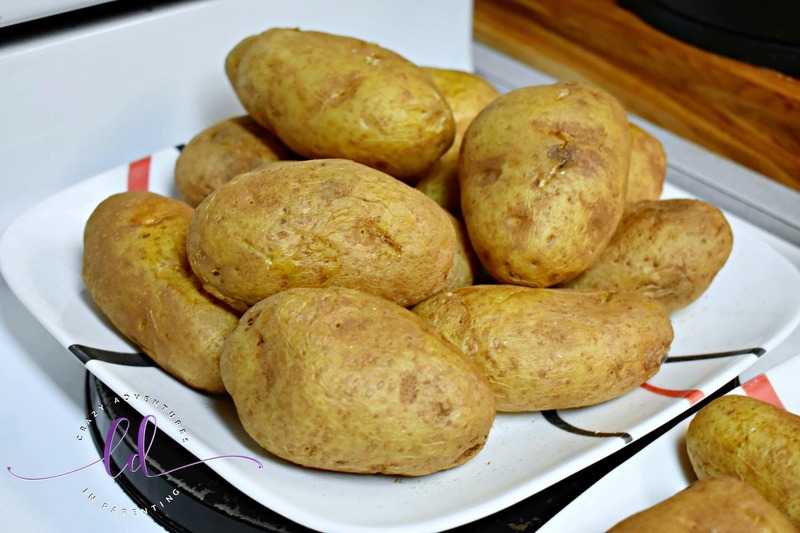 Once cooked through, allow to cook slightly before scooping out the potatoes – set aside. In a large 6qt saucepan over medium heat, melt the butter completely; add in the flour and whisk to form a roux. Add in milk and season to taste; whisk thoroughly until it begins to get thick. Add in potatoes and season again. Once bubbling, add in cheese and season stirring again. Stir the cheese around and let simmer. Ensure cheese is fully melted – the mixture will bubble again as it thickens. Add in sour cream and test seasoning before serving. Top with extra cheese, bacon bits, and/or green onions when serving. We like to make a “toppings bar” area so that anyone can add what they like to their potato soup. Tada! In a large 6qt saucepan over medium heat, melt the butter completely; add in the flour and whisk to form a roux. Add in milk and season to taste; whisk thoroughly until it begins to get thick. Add in potatoes and season again. Once bubbling, add in cheese and season stirring again. Once bubbling again, add in sour cream and test seasoning before serving. Top with extra cheese, bacon bits, and/or green onions when serving. I hope you enjoyed our potato soup recipe! Please feel free to check out my other dinner recipes and soup recipes while you’re here! And if you’re dying for more soup recipes, check out my friend Clarissa’s recipe for Italian Sausage Creamy Tortellini Soup, or April’s Instant Pot Carrot Soup, or Kelly’s French Onion Soup recipe, Michelle’s Instant Pot Beer Cheese Soup recipe, or Julie’s Slow Cooker Lasagna Soup recipe.